When the forsythia is about to burst forth, that's when you'll find loads of more flowering trees, shrubs and early perennials ready for planting at Ward's. Some blooms seen today are below. Currently on special! Save 20% when you buy 3 or more Forsythia in the 3 gal or 3-4 foot size. The cool spring so far is excellent for planting. Potted trees, shrubs and perennials can be shocked by a change in soil, sunlight and moisture. Keeping them cool when transplanted helps them acclimate and be ready when warm weather kicks in. In addition, now is the time to pick up native woodland spring bloomers and 'ephemerals'. These are the delightful finds of spring walks in the Berkshires that you can grow in your own lightly-shaded gardens, under deciduous trees. Foliage of 'Ephemerals' die back completely by summer having done all their 'work' in spring. Photos today won't do them justice as they are just emerging but now available are: Rue Anemone, Claytonia (Spring Beauty), native Dicentra (Dutchmans Breeches) Trout Lily, Sanguinea (Bloodroot), Hepatica, Mountain bluets, Phlox divaricata, Tiarella (Foam flower), Viola canadensis, and Lady Slipper Orchid. It's a great year to get them going in your own garden! Tiarella in bloom a bit later in the season. Sometimes Forsythia is all done by now, but not this year. Azalea 'Cornell Pink' - so pretty. Magnolia x soulangeana 'Alexandrina' puts on a magnificent spring show and offers dense, cooling shade in summer. 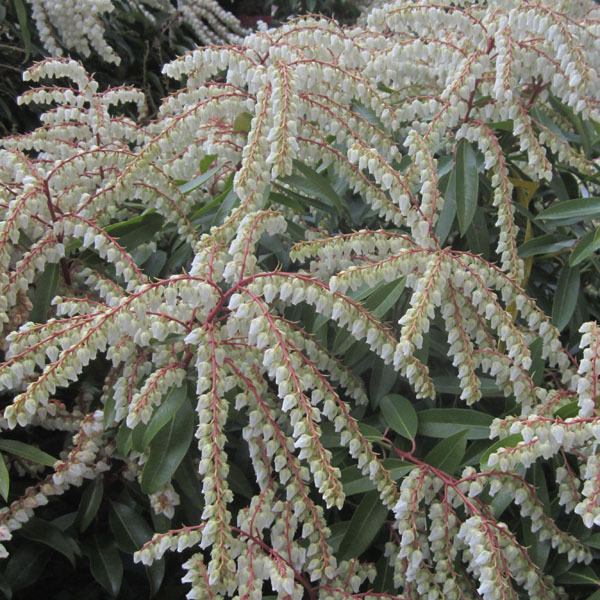 Pieris japonica or Andromeda attracts pollinators with its multiple bell-like flowers above the evergreen foliage. Close up of the thick flower clusters of Prunus 'Snow Fountain' the weeping white cherry. Click here to check out some perennials now in bloom!